Dit is geweldige informatie over oude Apple floppy, of beter: diskette formaten. Dit is enkel een back-up van de originele fantastische website. Puur omdat ik bang ben dat dit ooit offline gaat. To the author of this content: Thank you for this wonderful information about Apple floppy and diskette formats. I’m just preserving this great information, just in case your site would somehow go offline. It would be such a loss if that would happen. What is Not well-known is that these drives, being more generic, lack a crucial feature of Apple-specific floppy drives: Variable Speed. You may have noticed (or not) that long ago, when floppies were common, the original 3.5″ single-side double-density (SSDD or for our purposes SS) hard-case floppies held something like 270k or 360k on PC-compatible computers (if they even used those… i didn’t and don’t know) while the same floppy formatted and used on a Mac held 400k. 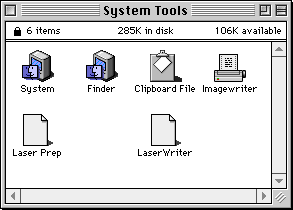 Similarly, double-side double-density (DSDD or for our purposes DS) 3.5″ floppies hold 720k on a Wintel, and 800k on a Mac. Many Mac users have found it tough to let go of their older Macs, especially early on when they were (relatively) very expensive pieces of equipment. A person might have several Macs, one or more of them original 128k or 512k non-Enhanced “Fat Macs” (Fat=more RAM in this case) with the original 64k ROMs which only understood MFS format. Sitting in front of their 512KE or newer Mac (with 128k or larger ROMs), they might very well want to format a double-sided diskette as single-sided, for use in their older Mac(s)—especially in the latter years of the 1980s and thereafter when SS/DD 3.5″ floppies first became scarce then disappeared from the market. Thus, while rare, it may not be terribly unusual within a specific floppy disk collection to find disks marked DS/DD with 400k capacity and MFS formatting. As well, floppy disks were expensive in the mid-late 1980s. Rumors circulated circa 1987 that due to lower demand for single-sided 400k diskettes, Sony merely ran the same production line for double-sided 800k and single-sided 400k, marking them differently and probably not QAing the second side for the ones being sold as single-sided. Someone found out that the less expensive Sony single-sided 3.5″ diskettes sold new during this period more often than not formatted successfully as 800k double-sided. Older Sony single-sided disks and most single-sided disks from other manufacturers would behave as expected: they would fail to format as two-sided. A failure to format dialog would appear and the disk would be ejected, as in the case of defective diskettes attempting to be (re- or initially) formatted at any capacity. Most of the usual repair utilities that can repair hard drives can also fix floppy disks. Try what you have. I start with the latest version of Apple Disk First Aid my Mac will run (8.6.1 for Power PC Macs, 8.2 for 32-bit 680×0 Macs, 7.2.4 for 24-bit Macs), then move to AlSoft DiskWarrior 2.1.1 (end of the 2 series). I’ve not been desperate enough to go beyond these for the very few floppies unable to be fixed by these two programs. Back in the 1990s during the Vintage Mac (“beige”) era, all 1.4 MB HD Mac floppy disks were HFS format. This was a limitation imposed by the OS, i presume for backwards compatibility and because the main advantage of HFS+ on the original (“vintage”) Mac OS was the change in allocation block size, for more efficient utilization of disk space for high-capacity volumes (hundreds of megabytes into gigabytes). As discussed in napabar’s post on 68kMLA Forums, OS X introduced the ability to format high-density floppies as HFS+. These floppies will work on Vintage Macs, as long as the OS supports HFS+, meaning OS 8.1 or newer. PowerBook5,6 is also known as the 15″ PowerBook G4 1.67 GHz January 2005 a.k.a. 15″ PowerBook G4 Aluminum 1.67 GHz low-res. and/or single-layer (optical) SuperDrive a.k.a. the very next-to-last ever 15″ PPC PowerBook. Disk Utility (Re)Format HFS or HFS+ HFS or HFS+ HFS or HFS+ Will erase (reformat) existing HFS standard floppies as HFS standard, but HFS+ is the only Mac option for floppies with no format or any other format. FAT and ExFAT (Windows) options only. So it looks like if your Vintage Mac is running OS 8.1 or newer, you can use a Mac and OS at least as new as the Mid-2010 Air and the current version of Mountain Lion as of November 2013 and use that new Mac to put software on an existing 1.4 MB HD HFS+ (Mac OS Extended) floppy and take it back to the Vintage Mac. The news is even better if you no longer care about the old Mac(s) and simply want your old Mac data on 1.4 MB HD Mac-formatted (HFS or HFS+) floppies on your much newer Mac: you can just pop those suckahs right into your bought/borrowed/gifted on Freecycle external USB floppy drive and copy that data right on over (and hope that some modern software reads the file format). I did not do any new (Nov. 2013) testing of this combination. To the best of my knowledge, all external (USB) floppy drives are based around a standard floppy mechanism as used in PC-compatible hardware. I verified in the past that 1.4 MB HD and 720k DS FAT formatted floppies can be read on OS 9 and OS 10.4.11 Tiger on PPC Macs, but i did not perform write testing. During the above testing of the Mac formats, i noticed that all Disk Utility versions i checked had at least the FAT format option available. Newer versions of DU add the ExFAT format. DU for Mountain Lion only formats floppy disks as FAT or ExFAT. To me, this formatting support indicates full read/write support in the OS/Finder, but i did not test it out. In other words, if you have DOS/Win PC 3.5″ floppies which you want to use on your modern Mac, seems like you can pop ’em in your attached external floppy drive and go to town. Vintage Mac users with a Vintage Mac new enough to run whatever version of PC Exchange (or equivalent Apple-bundled software for handling PC-originated media) came with the particular Mac OS in use may have another option to move files from a modern Mac to their Vintage Mac. As recently as the OS 10.8.5 Mountain Lion/MacBook Air Mid-2010 combination, one could attach an external floppy drive and format a 1.4 MB HD or 720k DS (and probably 360k SS but i’ve never tested that) as FAT (listed as MS-DOS in older versions of Disk Utility), load up the files, and via the PC Exchange mechanism have the Vintage Mac read the files. This ought to work for any Vintage Mac for which there was a version of PC Exchange (or equivalent… i think it may have been built into the OS later on). Quick research indicates that a SuperDrive and System 7 are required on the Vintage Mac to use PC Exchange, but i did not research this in depth. AppleTalk is my method of choice, especially for Macs of disparate generations. The first 128k Macintosh spoke AppleTalk. The new-in-November 2005 15″ PowerBook G4 Dual-Layer with OSeX Tiger 10.4 still speaks AppleTalk. Perfect, right? End of story, right? If your email is via the WWW rather than a standard email client, most of the issues above apply, yet there may be more or fewer. Again too many variables to discuss. Your best bet for a web browser on the older Mac which will actually work with today’s web mail is iCab. PPC Macs running OS 8.6 or later can and should use iCab 3.0.5 as of this writing (or a newer iCab 3. iCab 4 or later is not an option). Older Macs back to some of those running System 7.0.1• can, with care, run iCab 2.9.9 (available in versions for 680×0 and PPC). This page is not going to further cover the KryoFlux system, as it is a whole different approach and has its own active support community (and because the author of this page doesn’t have one and has never used one). The point of this section is to mention that such a device exists, and may be the best choice for certain people. I tested several 720k DOS (FAT) format floppies on my VST FDUSB-M external USB floppy drive, on both a 9600/350 running OS 9 and a PowerBook G4 15″ 1.67 GHz next-to-last model running OS 10.4.11 Tiger: mounted and readable on both systems. I did not test writing to the floppies.
. I very highly recommend Eric’s carefully researched site Apple Macintosh before System 7 for just about any information related to this class of early vintage Macs.